Kick off the new year with a fun money check-in with your child. You can go over his accomplishments last year, and set a course for 2011. 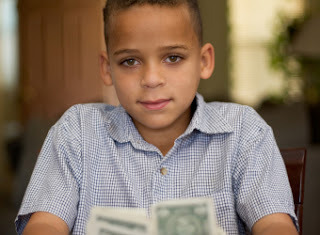 Here are four key questions to ask your child to get things rolling, from ThreeJars.com founder and CEO Anton Simunovic and ThreeJars financial expert Jean Chatzky. “It doesn’t matter how much really,” says Simunovic. “Any money saved is an accomplishment because when kids start to save a little, it alters their mindset and they’ll want to save more.” So check his Save jar, discuss whether it was hard or easy for him to save and whether he feels he met his own saving goal or not. The start of the new year is also the perfect time to discuss an allowance raise (that’s sure to get him excited to have a money talk! ), especially if your child has been showing you he’s been responsible with his money, says Chatzky. What money goals did you achieve last year, and what goals do you have for this year? Once your child starts saving, it’s important for him to set goals that specifically indicate what he’s saving up for so he stays motivated. Make a checklist and see how many of his goals were met last year. If there are a few things he didn’t get to, discuss the math and show him what he can do to make these things possible for the coming year. Then list his goals for this year, from small things, like not buying candy every allowance day, to big things, like saving for a bike or increasing his charitable giving. What have you spent your money on (and are you happy with your purchases)? Think of this as a spending lesson recap, which is a great way to spur your child to think strategically about where his money goes. Go over some of the things he bought last year. If there was a misguided purchase (in your opinion), ask him whether or not he thinks it was worth the money. Be sure to discuss purchases that were “worth it,” too—he needs both angles to make wise choices in the future. Just try not to tell him how to spend his money. Remind yourself that it’s his allowance, and it’s up to him how to spend it. It’s the only way he’ll learn. “Kids become much more frugal when it’s their own money they’re spending,” says Simunovic. If they ask you whether something is worth the money, give your advice but let it be his decision, Chatzky says. How much did you share with others? You may think that it would be hard for kids to give their money away to charities, but Simunovic says that the notion of sharing is generally deeply gratifying for kids. “It makes them feel like they’re helping,” he says. So talk about which organizations he donated to last year, if any, and brainstorm whom he’d like to help this year—wolves, whales, underprivileged kids, Mother Nature? Check out “Match Your Child With His Ideal Cause” and go to ThreeJars.com for more information on charities kids love.